Liberal bias plays a role, but it's premature and inaccurate to say that explains everything. America seems to be in a golden age of the filibuster. First, there was Rand Paul's March attempt to derail John Brennan's nomination as CIA director. Then there was Texas state Senator Wendy Davis's filibuster of a bill to restrict abortions in the state. And now there's Ted Cruz's "fauxlibuster," a long speech he began Tuesday but will have to wrap up by around noon Wednesday. There's a raging debate on Twitter over how the speeches were treated in the press (since that's surely what all three legislators wanted to happen when they embarked on policy-based stands). Conservatives charge that Davis, a Democrat, was portrayed as courageous, while Cruz, a Republican, is being ridiculed and dismissed. Is the coverage slanted, and if so, does simple partisanship explain it? Here are a few explanations for the discrepancy. Liberal media bias. Let's get this one out of the way now: Many mainstream reporters lean left, and that colors coverage. Many of the complaints are about not news stories but editorials by predictably liberal editorial boards. Now, it should come as no surprise to anyone that the liberal editorial board of the New York Times blasted Cruz. (It doesn't appear the paper wrote an editorial on Davis's filibuster, though the board's blog was generally sympathetic.) But this is a complaint that news coverage is too dismissive, too. Bias isn't enough to explain everything here. It's too early to tell. As Dylan Byers rightly points out, Davis became a media fixation -- even her shoes became star. And yet Cruz isn't even on the front page of the Times! But on June 26, 2013, the day after Davis' filibuster, she wasn't on the front page of the Times either. It was only over the ensuing week that her star rose. The trick is to watch how Cruz is covered in the next few days. To speak of a "media blackout" is premature. If it's all bias, what about Paul? The Kentucky senator's crusade (which Cruz aided!) against drones drew a round of coverage just as adoring as anything that followed Davis and helped solidify his status as a top-tier presidential contender for 2016. How does one explain such positive coverage of a Republican? The politics are substantively different. It's reporters' job to portray the facts of a given situation. Davis's speech united liberals in celebration and earned an approving tweet from the president. Paul's filibuster helped galvanize a coalition of libertarian Republicans and civil-libertarian Democrats. Cruz, on the other hand, has been widely criticized by his own party. While his stand has endeared him to activists, it has earned the derision of Republican leaders, rank and file legislators, strategists, and commentators. If Cruz were uniting the GOP and leading a successful revolt against Obamacare, it would be reported that way and he'd look triumphant. As is, he's dividing his party and won't overturn the law, so the coverage reflects that. Davis and Paul's filibusters actually mattered. 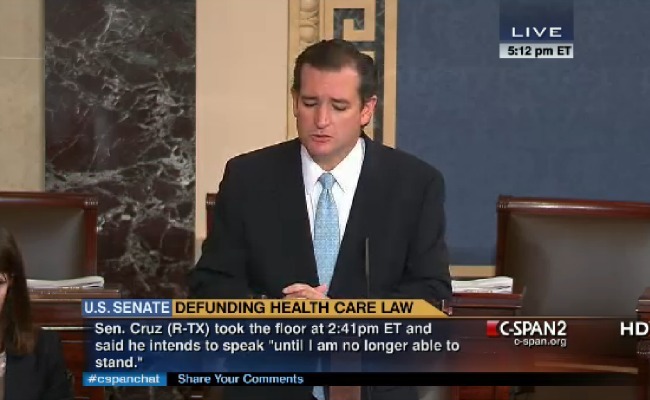 It doesn't matter if Cruz talks until noon: According to Senate rules, a vote must be held, and Cruz can't talk to delay it in the style of old-school talking filibusters. That's the key difference between Cruz's speech on one hand, and on the other Davis's filibuster -- which ran out a session and killed a bill, although it was passed in a later special session -- and Paul's filibuster, which did stall Brennan's nomination, at least for 12 hours until Paul gave up. Paul also got results: He extracted a letter from Attorney General Eric Holder promising the federal government wouldn't use drones stateside, the sort of concession Cruz is almost certain not to receive from the White House. As my colleague Molly Ball has pointed out, there are some serious logical problems with Cruz's stand. One, he's calling on his colleagues to filibuster a bill they called for; and two, no one believes he will succeed in getting Obamacare defunded. That opens him up to the charge that he's grandstanding. Were Davis and Paul grandstanding too? Of course. But there was a concrete political goal in view as well.